RYAN International School is always a pioneer in stepping up the step for the betterment of its students. A workshop on ‘Child Abuse’ was conducted in the school premises on Saturday, August 11, 2018. It was a venture in collaboration with Bharat Vikas Parishad (Mewar). Speaker for the session was honorable ADJ Shri Mahendra Kumar Dave. 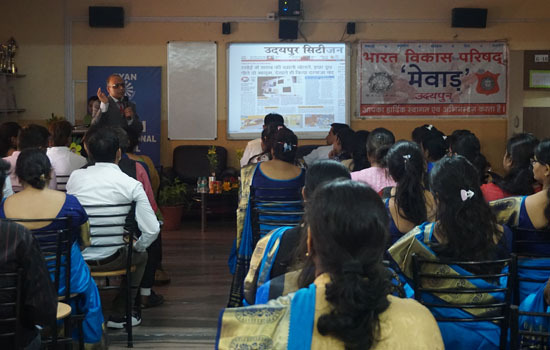 He enlightened the parents and staff regarding POCSO Act 2012. In his session Mr. Dave spoke about Gender Neutral, Growing society and its problems, Sexual Harassment, Sexual Assault, Aggravated Sexual Assault, Good Touch and Bad Touch, Difference between attempt and abetment and many more social child related issues. The queries of students and parents were solved. ADJ was also interviewed by the YJ’s . Principal, Mrs. Poonam Rathore thanked the gathering.